And the house smells so good. 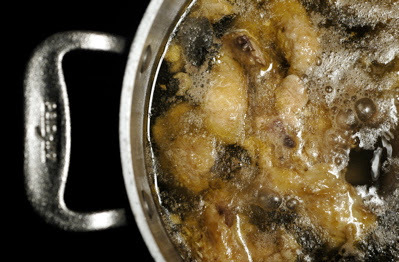 I concluded today that the smell of "yellow" is chicken stock — and it really helps if you have a two-story house, because you can go upstairs and get a real snootful of the delicious aroma. I hate to think how many chicken carcasses I threw away in the past, after eating the insipid supermarket flesh off them. Well, maybe I was right to throw them away. But this? Mmm. I wish I could take a picture of how good it smells. Food styling by Martinelli Farms, All-Clad, Mt. Tamalpais watershed. Photography by me on a little kitchen stepladder. Cranky held me up with his spare hand. mmmm... I can actually smell it! It smells like yellow, you're right! Nectar of the Gods! I can smell it, too! Love the behind the scenes info! Adds a certain touch of 'je ne sais qua' to the pic! The bird smells great, but (no offense, great photo) where are the herbs or veggies? Speaking of good chicken though, a few years ago while struggling with the animal-ness of working with meat, I figured I should confront it head-on and start buying the whole chicken from now on, forcing myself to dismember its little body and remind myself that this is a creature that I should be thankful for. Living on one income, trying to buy good ingredients, it was WAY too wasteful to do anything but start making my own stock. Now, I just love that the seasons are reflected in this too, as the herbs in our stock is usually reflective of what can be had outside. I too can smell it. Nothing like the smell of stock simmering. I wish we were having chicken tonight! Anita: You amaze me. If I was using a makeshift galley while my kitchen was being remodeled, it would be for all burritos, all the time. Easy burritos. Canned beans, crappy cheese. Ilva: That was fun for me; I might do it more often. Thanks. D-Man: No offense. There are herbs, and the veggies -- well, long story -- are in the Romertopf. Usually they go in the stockpot. Martinelli: From Bryan's Fine Foods. SF and Corte Madera. Dagny: I happened upon a chicken-stock blog entry today from nearly a year ago, and at the end of her introductory paragraph, she said something like "and it makes the house smell so good." mmm! so what're you doing with the stock? Pinkie: I just always compulsively make chicken stock whenever we have a chicken, from the bones and skin and fat, and little shreds of meat that are still stuck to the bones. It's usually destined for the freezer, and that way I always have homemade stock on hand. But! Some of this batch is going directly into soup made from the vegetables that we roasted the chicken with. Soon.